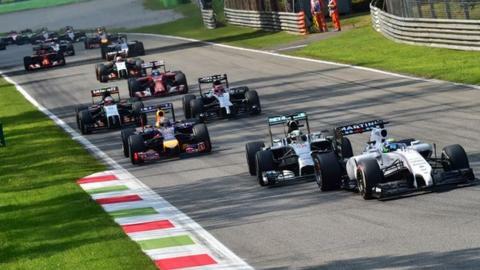 Formula 1 is considering introducing more powerful, louder but cheaper engines within the next few years. The sport only switched to the cutting edge V6 turbo hybrid engines for 2014 but there are concerns in some quarters these are too expensive and too quiet. Bosses have asked a working group to deliver proposals as to how to adapt the engines to meet their demands. Its first meeting will be on 6 January, but, given the complexity of the project, a change for 2016 is unlikely. Meanwhile, Ferrari and Renault are close to winning the right to be allowed in-season engine development in next year's championship. The teams have been pushing for a relaxation of the rules for months, arguing they need a chance to catch up with constructors' championship winners Mercedes. Governing body the FIA had intended that any changes to engines from this year into next must be presented for approval by 28 February, with development forbidden thereafter other than for reliability, cost-saving or fuel efficiency reasons. But Renault and Ferrari have argued that a loophole in the regulations meant this was not precisely defined. The issue was discussed at a meeting of the rule-making strategy group on Thursday. And it now seems likely that manufacturers will be able to upgrade their engines after the start of the season as well as before it. However, an expected clarification from the FIA on the subject did not materialise on Friday as the organisation worked to establish the most robust possible wording. If, as expected, Renault's and Ferrari's arguments are accepted, both are likely to introduce major developments during the year. But Mercedes, whose engine was dominant in the first season of the new turbo hybrid engine formula in 2014, will be able to do the same. However, there will still be some restrictions on how much an engine can be modified in a given year. "Any modifications would still have to comply with the restrictions that already govern engine development. "Aimed at keeping costs down, these follow a formula that defines 92% of the engine as being open to development from the first season of the design to the second. "From this, manufacturers choose a maximum of 48% they can develop. "This 48% is split into 32 "tokens", assigned to parts of the engine depending on their influence on performance. "Manufacturers would be able to implement their 32 development tokens throughout the year, rather than having to use all before the season starts." The surprise inclusion by F1 boss Bernie Ecclestone to add Korea to the 2015 calendar, taking the season to a record 21 races, has also come in for criticism. Korea was added because it was felt it might be a way around the rule restricting manufacturers to four engines in 2015, a reduction of one from last season. The issue arose following pressure from Renault, who struggled for reliability in 2014, applied through their works team Red Bull. The rules dictate that if there are more than 20 races when the calendar was "originally scheduled", five engines would be allowed. But some have argued that the calendar produced in December, which featured Korea, was not the first one issued - there was an earlier one in September. The most likely scenario is that Korea will be dropped, there will be 20 races and the teams will be restricted to four engines as originally planned.